Many people who suffer from this medical condition will most probably have it for life. It is possible to see a clearer skin by learning about psoriasis and seeing a dermatologist for treatment. Research shows that the person’s immune system plays an important role. It seems that the immune system mistakenly activates a type of white blood cell called a T cell. Once activated, the T cells trigger a reaction, causing the skin cells to grow too quickly. New skin cells form in days rather than weeks. The body does not shed these skin cells, so the cells pile up on the surface of the skin. The result is psoriasis. Despite its appearance, it is not contagious. People who get it tend to have a blood relative who has it, indicating that to get it, a person must have it in the genes. Scientists have learned that not everyone inherits it. For psoriasis to appear, it seems that a person must inherit the right mix of genes and be exposed to a trigger. Common triggers include stress, strep throat, and cold weather. The condition may aggravate during the winter or at a particularly stressful time. A scratch or bad sunburn may trigger it as well. In some cases, psoriasis flares about 10 to 14 days after they injure their skin. Some people develop a type of arthritis called psoriatic arthritis. The first sign is frequently swollen, stiff, and sometimes painful joints when waking up. If this happens, tell a dermatologist right away. Like psoriasis, psoriatic arthritis is a lifelong condition. If psoriatic arthritis worsens, the affected joints can deteriorate. Medication can help prevent this. This is why it is so important to tell a dermatologist about your problems. Dermatologists diagnose psoriasis by examining the patient’s skin, nails, and scalp. To find out if anything else may have developed such as an infection, a dermatologist may perform a biopsy during an office visit. About 80 % of people living with psoriasis have plaque type. This type causes patches of raised, reddish skin covered by silvery white scale. Patches frequently form on the elbows, knees, and lower back, but may occur anywhere on the skin. 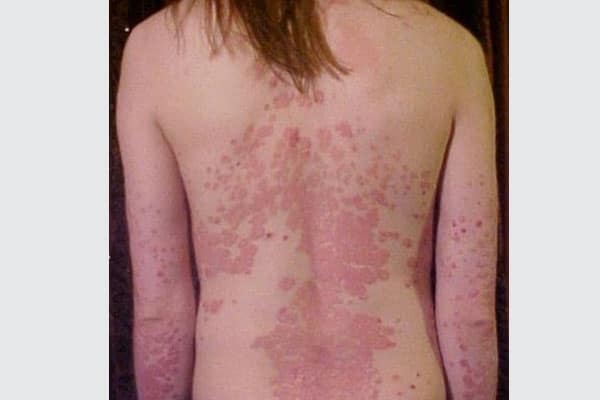 Identical in appearance to plaque psoriasis on the body; it is characterized by silvery white scales and reddish patches. 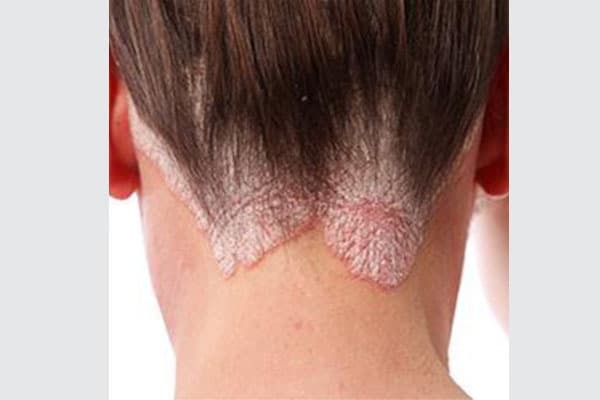 Scalp psoriasis also tends to be very itchy. Because patients often cannot help scratching and the scales fall onto a patient’s clothing, scalp psoriasis can be misdiagnosed as a dandruff. Even with the right diagnosis can be difficult to control. Psoriasis can affect the fingernails and toenails. One sign of this is tiny pits in the nails. As the psoriasis worsens, the nails may loosen, thicken, and eventually crumble. Sometimes nail psoriasis is misdiagnosed as a nail infection. This type usually occurs in children and young adults, causing small, red spots on the skin. It often appears after a sore throat and frequently clears up by itself in weeks or a few months. Many people never have psoriasis again. If a person already has plaque psoriasis and guttate psoriasis develops, it often means the psoriasis is worsening. 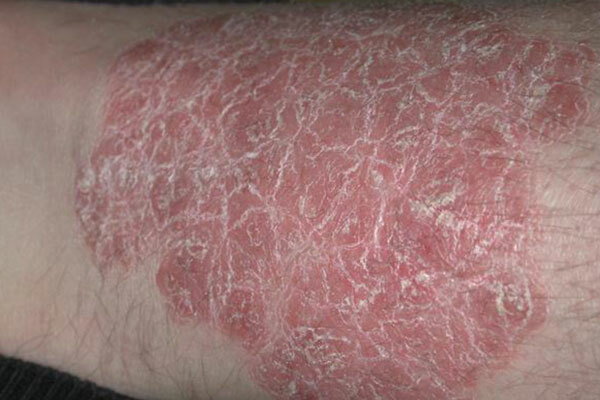 Usually appearing on the palms and soles, this type of psoriasis looks like white pus-filled bumps surrounded by red skin. Pustular psoriasis can also develop all over the body. 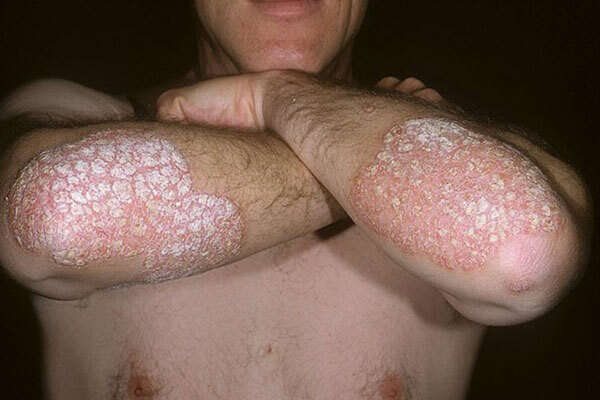 This causes a severe and sometimes life-threatening psoriasis that dermatologists call generalized pustular psoriasis. Smooth, red patches in the folds of the skin, including an armpit, under the breasts, in the crease of the buttocks, and in genital area. It can be painful. The least common, this type causes severe redness and shedding of the skin over a large portion of the body. The skin looks as if it has been burned. There is often severe itching and pain. While there is no cure for psoriasis, treatment may alleviate and help control the condition. Because psoriasis can be stubborn, gaining control may require trying different types of treatment and several appointments with a dermatologist. Some patients receive more than one type of treatment – for an example, a patient may receive light therapy and medication simultaneously. When psoriasis requires stronger medicine intake, using more than one treatment often produces the best results and causes fewer side effects.